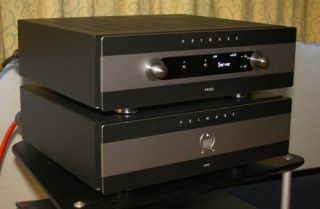 Bristol Show: Primare shows-off 60 Series pre/power amplifiers | What Hi-Fi? Primare has officially unveiled its 60 Series pre/power amps at the Bristol Show 2014. The PRE 60 is a preamp, DAC and streamer in one integrated system. It supports high-res audio files up to 24bit/192kHz from a number of sources, including USB, iPod, LAN and internet radio, as well as the usual analogue and digital inputs. At £6500 a piece, the new components take Primare back into the high-end market and are a major step up from the 30 series. The PRE60 is a reference audiophile dual-mono pre-amplifer to complement all high-end power amplifers, but primarily the matching A60 UFPD power amp. It has a comprehensive OLED display and two pairs of low-noise balanced XLR inputs and four pairs of RCA inputs. Meanwhile, the A60 is a fully balanced 2 x 250W UFPD stereo power amplifier that is designed to provide high power output with very low distortion through four discrete amplifers (two per channel). Each channel has unbalanced RCA and balanced Neutrik XLR inputs, as well as WBT Nextgen speaker terminals, trigger and RS232 control inputs. We also had a peak at Primare’s free iOS and Android app, which allows you to control the system and install firmware updates. The units we saw were in a smart two-tone titanium and black finish – unusual for Primare – but we were told they are also available in all black or titanium. The amps cost £6500 each and will be available in April.